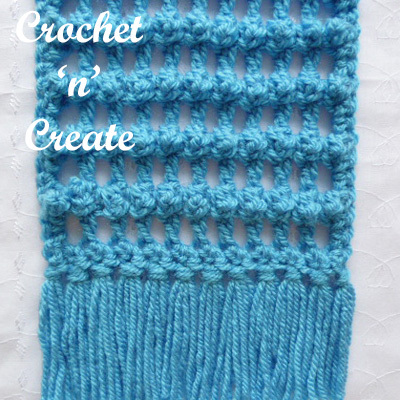 I have made a combination of some really lovely crochet stitches in my crochet filet bobble scarf uk format, the bobble and open filet look on this scarf creates a light and soft feel using a 5.50mm hook. I have used chain spaces, tr, dtr and dc to make. 3rd Row – ss into first dtr, make 4ch, * miss 1dc, work 1tr into next dtr, make 1ch, * rpt from * to * to last dc and dtr, miss dc, work 1tr into dtr. Turn. 4th Row – 1ch, 1dtr into base of 1ch, * 1dc into 1ch space, 1dtr into next tr, * rpt from * to * to last 4ch, 1dc into 4ch space, (1dtr, ss) into 3rd of 4ch. Turn. 5th Row – ss into first dtr, make 4ch, * miss 1dc, work 1tr into next dtr, make 1ch, * rpt from * to * to last dc and dtr, miss dc, work 1tr into dtr. Turn. Rpt 4th & 5th Rows 68 more times until 70 bobble rows have been worked from beginning or work measures approx 55.5 Inches in all. Turn. Border – 1ch, 1dc into base of 1ch, 1dc into each 1ch space and tr to end, 3dc into 3rd of 4ch, work 208dc evenly into row ends down first side of scarf, 3dc into corner, 1dc into each ch along starting ch edge, 3dc into corner, work 208dc evenly into row ends up second side of scarf, 1dc into corner, ss to first dc. Fasten off. Weave in any loose ends of yarn and trim. Finishing – On each end of the scarf attach the tassels by folding each tassel in half and threading open ends through every alternative dc, pull ends through loop you have created and tighten to secure. Make sure you pin to your boards! The written instructions and pictures for this crochet filet bobble scarf uk pattern are copyrighted to crochet ‘n’ create © 2018. 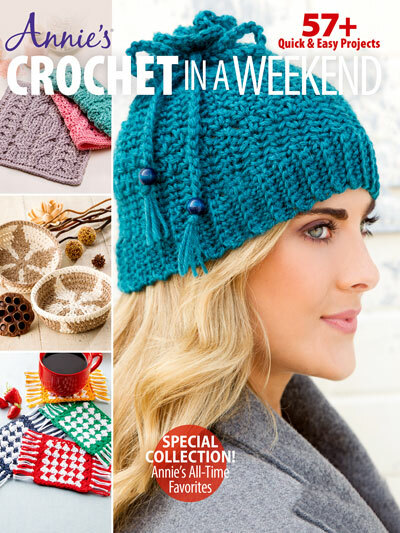 You are welcome to sell the finished products made from the free crochet filet bobble scarf uk pattern, I just ask that you use your own pictures and put a link back to crochet ‘n’ create. If you wish to tell your friends and followers about this pattern, please only use a direct link to the pattern page on crochet ‘n’ create. 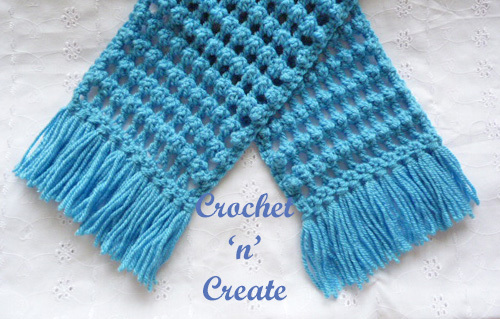 DO NOT share the written instructions for this crochet filet bobble scarf uk pattern. 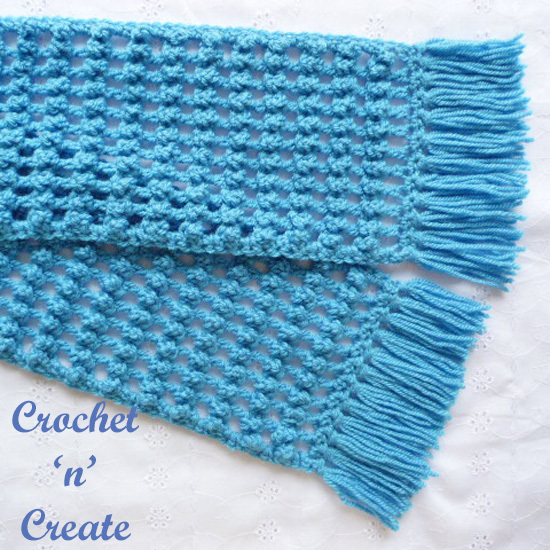 This entry was posted in crochet scarves, Filet and tagged crochet, crochet ladieswear, crochet scarf, free crochet patterns on 11th April 2018 by crochetncreate.